The Lortone QT-6 Rotary Rock Tumbler is perfect for larger items and moderate production use. This mid-size tumbler features a heavy-duty motor, welded steel frame and rubber barrels. Can be used for dry or wet tumbling. 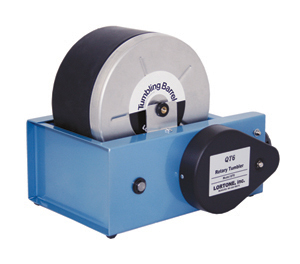 The Lortone QT-6 Rotary Rock Tumbler is a professional grade machine with heavy-duty motor and 10-sided molded-rubber barrel, able to polish up to 6 pounds at a time. It's perfect for polishing rock, brass, castings, beads, glass and more. It's easy to use, even for a beginner, but produces professional results. All-steel body is strong and stable, with a handsome stainless steel drive cover. Choose Tumbler only or Tumbler + Grit Kit from drop down menu. Kit includes 5 pounds of each: 80 coarse grit, 220 medium grit, and 600 fine grit; plus 1 pound each of Micro Alumina Polish and plastic pellets. Plastic Pellets are use in the pre-polish and polish stages to cushion stones and help carry polish. Also works well as a filler for small loads. Long wearing and reusable. Tumbler + Kit shipped in 2 boxes.